It’s hard to believe just how quickly the holidays are approaching (how is Thanksgiving next week?!?!). 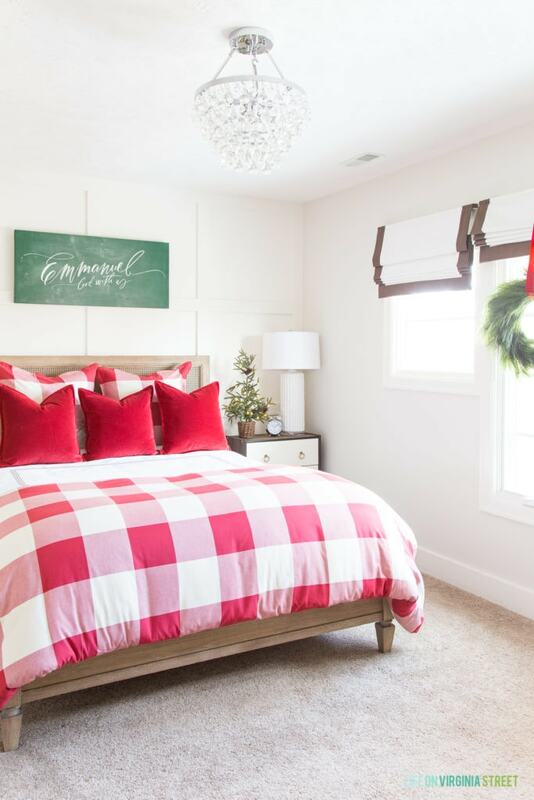 A few weeks ago, I shared my Christmas decor design plans, and today I’m sharing one of those rooms come to life! 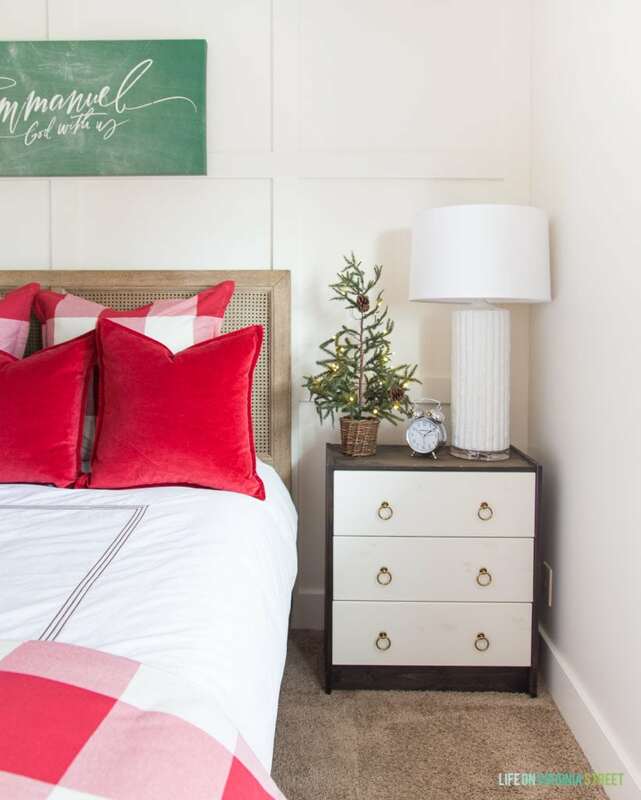 Along with that, I’ll be sharing some simple tips for creating a guest bedroom retreat to make your guests feel at home! Although most of these tips are useful year round, you’ll quickly see that my updates have a Christmas spin. I’m loving the festive new look in our guest bedroom. Following are my tips for making your guests feel even more welcome during the holidays and all year round! 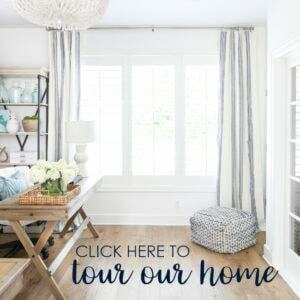 And, as a side note, I just noticed that Pottery Barn extended their Buy More, Save More sale by a day, so you can get 15-30% off plus free shipping on most of the items I’m sharing today with code SAVEMORE! This is really embarrassing to admit. As much as I refresh the look of our guest bedrooms seasonally, I hadn’t replaced the sheets or duvet cover in this room for over eight years. Since the room never used to get used as frequently as our other guest bedroom, I don’t think it was the end of the world. But after frequent washings, the age of both items had begun to show (particularly on the old duvet cover). I decided it was time to finally upgrade the bedding, and bought this white duvet cover with taupe details. It’s almost identical to the one we had in here before, and I figured if the classic design lasted me as long as it did, why mess with a good thing? The cover is not only organic cotton, but it comes from the new Fair Trade line at Pottery Barn. These items are products that are made using Fair Trade USA-certified materials and/or manufactured in a Fair Trade USA-certified factory. The non-profit gives farmers, workers and communities in developing nations the tools they need to leverage the free market and live fair, healthy and sustainable lives! You know I’m a huge fan of crisp white bedding and this duvet cover gives that upscale hotel bedding vibe that I love so much and it’s the perfect year-round staple regardless of how the rest of the decor changes. And it’s even better when you can feel good about how the products are made! The older I’ve gotten, the more I’ve realized how critical space for luggage can be. Even in the smallest of rooms it can be helpful to add a small luggage rack, a bench, empty chair, empty drawer space, a few hangers in the closet, or even just enough floor space for luggage and items packed! The drawers in our desk can even be used as added storage. 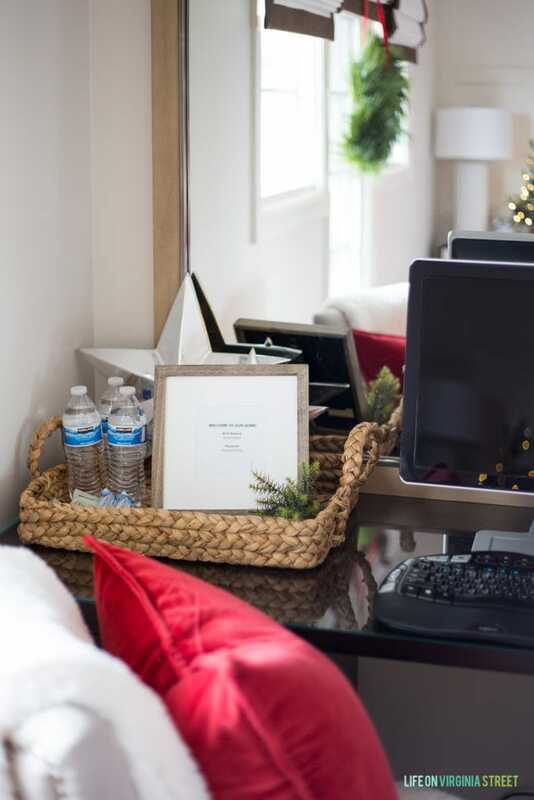 I love to add a tray or basket to our guest rooms, stocked with water bottles, protein bars, extra towels, extra shampoo/conditioner/soap and easy WI-FI access. It’s so easy to say “let me know if you need anything”, but I’ve learned sometimes guests don’t want to impose or ask! So, I try to make simple, everyday items readily accessible! In the adjoining guest bathroom, I have glass canisters filled with cotton balls, q-tips, and travel sized versions of shower and body essentials. Although we offer our guests full access to our main linen closet, I still try and stack ample towels in the guest bathroom so they are nearby. I desperately need to paint the walls in here. It’s the original flat paint from when our house was built 10+ years ago and it’s in rough shape. 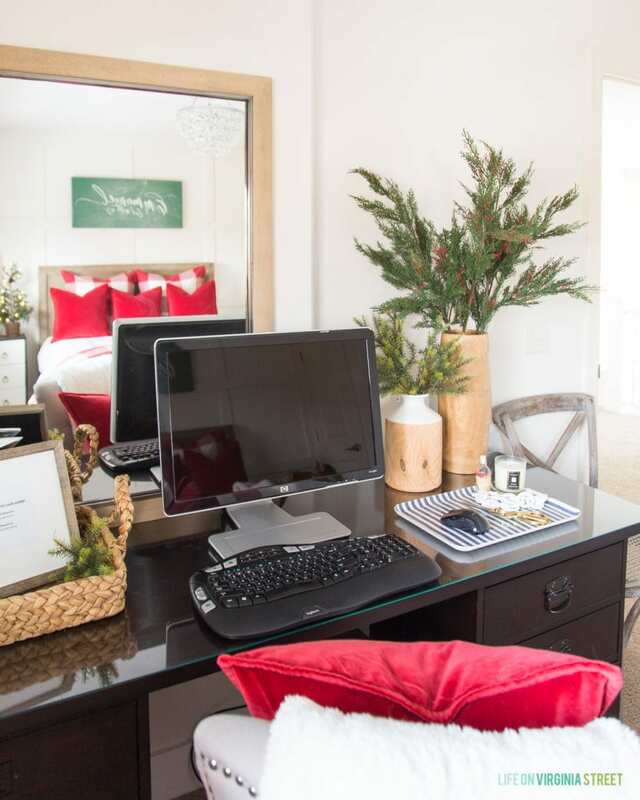 But, that doesn’t mean the space still can’t feel homey and welcoming with the addition of these items! 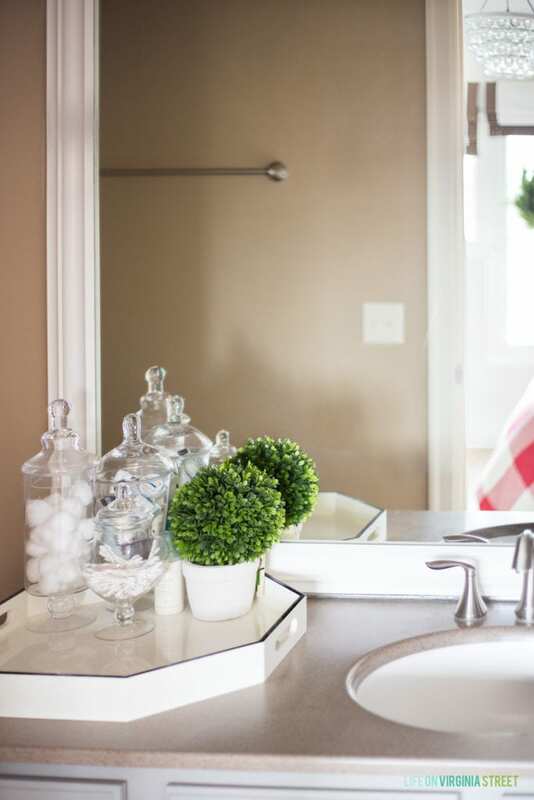 I love adding greenery, fresh or faux, to any space to inject some life. The guest bedroom should be no exception! Although I may tend to go overboard with all the greenery, it’s one of my favorite ways to really make a room come alive and feel more lived in. These faux berry juniper branches are one of my favorite finds of the season! This is obviously completely optional, but I think it’s a fun addition! 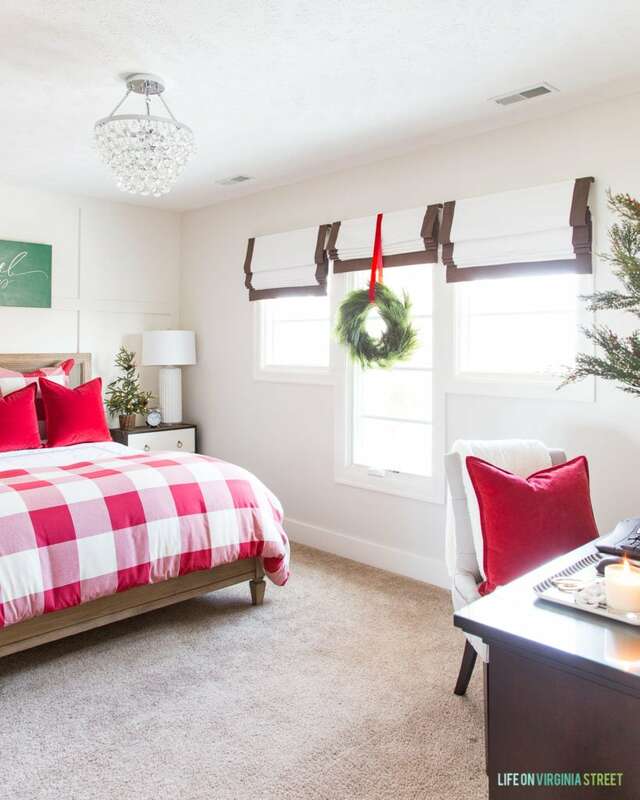 Guest bedrooms seem to be the most overlooked areas in our homes when it comes to holiday decorating. But they’re one of my favorite places to add a festive touch. Guests will appreciate even something as simple as a wreath hanging on the window or a lighted mini Christmas tree! I hope you found these simple tips helpful! If you have any other tried and true tips, I’d love to hear them! Such a pretty room. 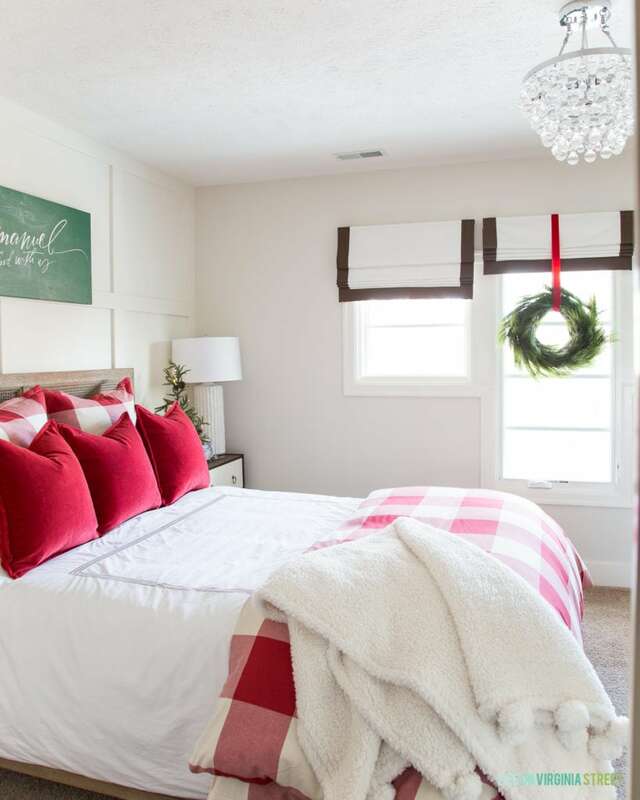 I love the red check comforter, so perfect and the wreath on the window is also pretty. 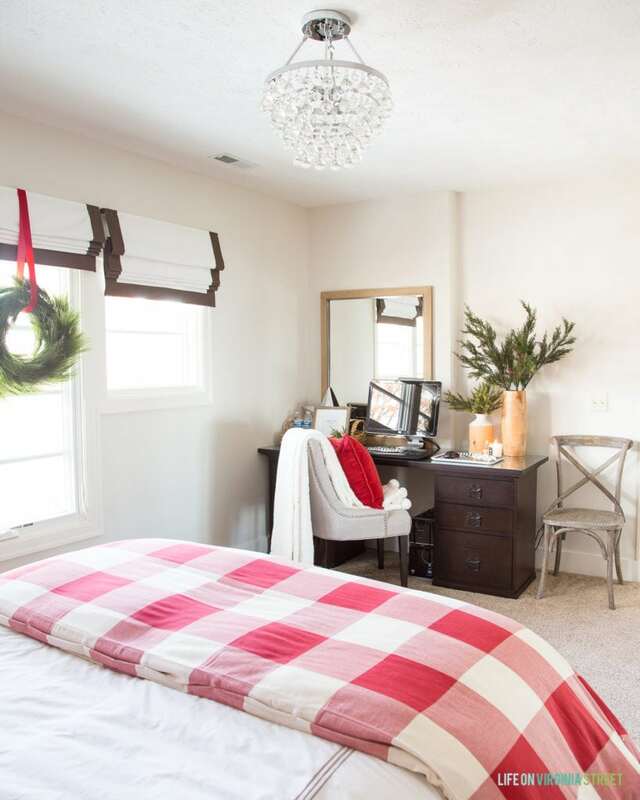 This looks like a perfect guest room for anyone. That office area is pretty special too. 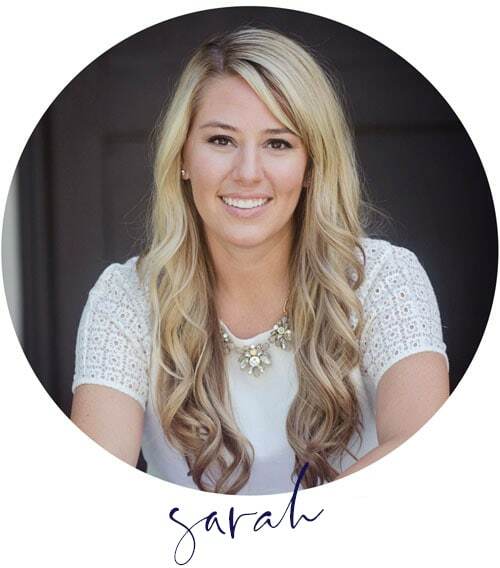 Sarah, where do you get your duvet inserts? The buffalo check and white duvet covers are very nice, as is the whole room. I’ve had these for ages (I think I maybe got them at Overstock?) but I’ve also had good luck recently with ones from Amazon!